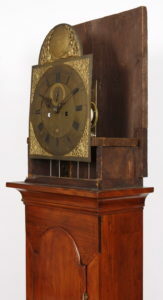 Circa 1750 Early Queen Anne New Jersey Tall Case clock with maximum overall dimensions of 89 X 19 X 10 inches made by Aaron Miller of Elizabeth Town. 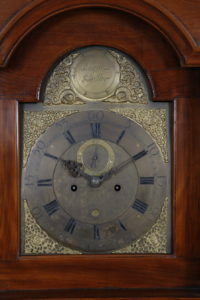 This is an important clock that has been buried in a home in the Trenton area for generations. 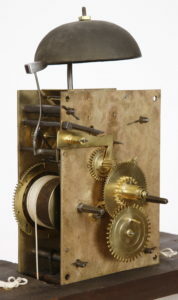 Clocks by Miller are well documented in Clocks & Watches of New Jersey by William Drost published in 1966. 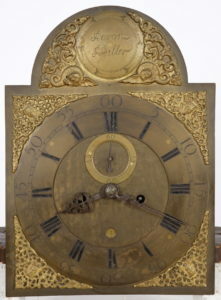 Last winter I was contacted by the a friend who knew of this important clock and advised me that the family was considering selling the piece and would I be interested in it. As you may imagine, this was not a difficult decision to go ahead and acquire the clock. 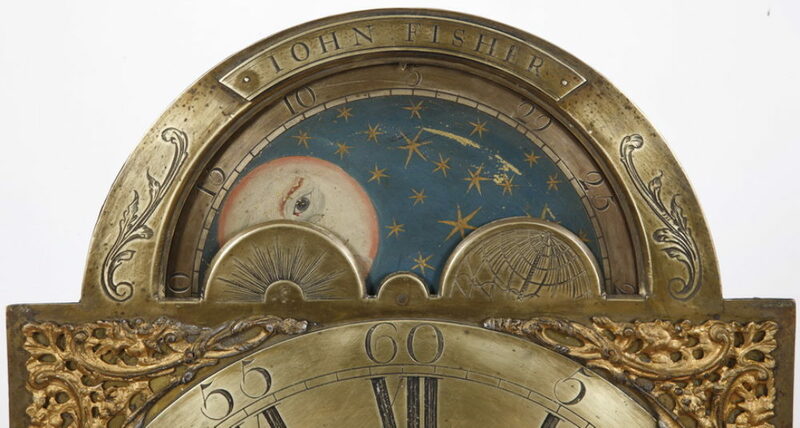 The case was in need of conservation and the works clearly had not been run or serviced in many years. The project was completed in about 4 months and you can see the fruits of our labor in these photos. 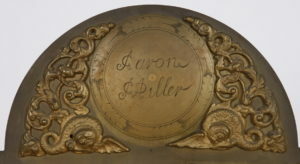 The flat top Cherry & Red Gum case with bold crown molding, arched bonnet door flanked by two attached block and turned columns opening to a early brass dial with applied spandrels, chapter ring, seconds bit, date register, and engraved name boss in the arch signed Aaron Miller. The glass in the bonnet door is old and wavy and possibly original. 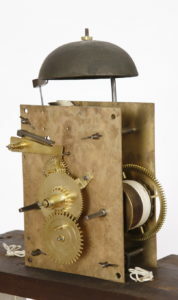 The works behind the dial are very identifiable to Aaron Miller with wood winding drums, steel pillars, count wheel strike train, and resonant bell. The works have been meticulously serviced and the clock runs and strikes perfectly. This is clearly one of Miller’s earliest movements having full rectangular plates as compared with later examples configures with large circular cutouts in the lower sections. 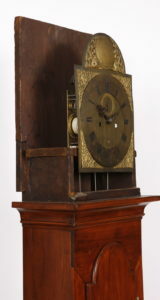 The waist section with tombstone shaped door and cast brass strap hinges are consistent with the period of the case. The base continues to a molding and straight bracket feet. And the best part about the feet is that they are original ! Can you imagine owning a piece of case furniture that is over 250 years old with the original feet? 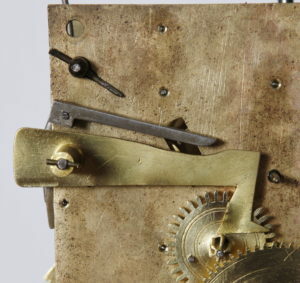 The sides and backboard of the clock are extremely thick over 5/4 thick and the back feet are cutout of the backboard. We completed the restoration of this incredible clock this afternoon and it is ready for another 250 years of enjoyment and timekeeping for future generations.